Thanks to a measure signed into law by President Donald Trump, March 29th has been designated as The Vietnam War Veterans Day! All citizens are encouraged to display the U.S. flag on that day in honor of Vietnam Veterans. When a neighbor is in need, the community of Cooleemee comes together to help and they have arranged a bake sale and raffle on Saturday, March 16th beginning at 9 am in the Cooleemee Shopping Center parking lot to benefit their own Dean McSwain. Late last month, Dean McSwain, the sole mechanic at Village Auto Center on Highway 801 in Cooleemee, fell and suffered a concussion that has put him out of commission, with double vision and other discomforts that are taking a toll on his life and his family. Dean has helped almost everyone in town over the decades he worked as the sole mechanic at Village Auto. When money was tight, Dean found ways to work with his neighbors. When someone was in need, Dean was always ready to help. As honest as the day is long, Dean was someone everybody in town knew they could trust and count on. Rich, poor, old or young, Dean was always there to help! According to Judy Webb, “Dean has always been a helping to hand to anyone on town that had a need. In all my years in Cooleemee I’ve heard nothing but praise and thankfulness for Dean and I’m glad to hear the community coming together to help someone in need! I’m so thankful to be working with Hellen Daywalt, Arlene Anderson, Jessica Almond, Jeanie Taylor and many others to put this benefit together. Well, it’s our turn now! There are several ways you can help. First, bake one of those favorite dishes or desserts to donate to the bake sale. If you aren’t a baker, search for something to donate for a raffle. But most of all, come out and join us on Saturday, March 16th to buy something or even just to make a donation! To donate baked goods or raffle items, or for more information, please contact Judy Webb at (336) 284-2758 or Town Commissioner Jessica Almond at (336) 284-6070. The Town of Cooleemee will host its first annual Christmas Parade at 4 PM on Saturday, November 24th! The parade will begin at Cooleemee Elementary School and end at the Zachary House. Families will gather on the grounds of the Zachary House after the parade for food, games, singing, and a reading of the Christmas Story. If course, Santa will be on hand for a chat and pictures with the children. To enter the parade, simply show up at the Cooleemee Elementary School prior to 4 PM. No pre-registrations is necessary. 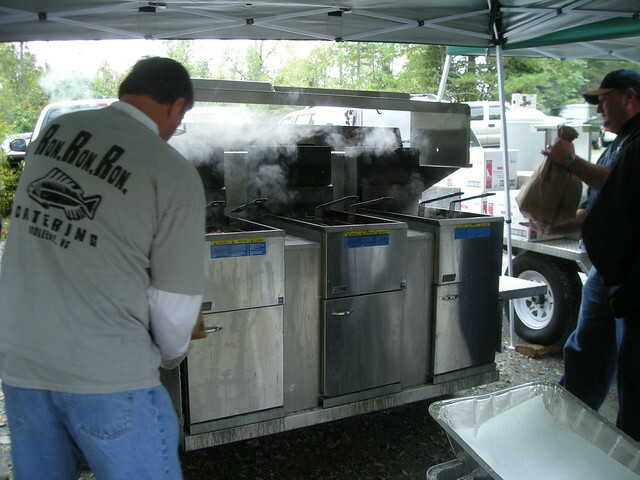 RiverPark at Cooleemee Falls—also known as “The Bullhole”—will hold its 15th Annual Catfish Fry on Saturday, October 27th from 11 a.m. – 2 p.m. Come to the big Margaret Woodson Picnic Shelter on the Rowan side of the park for the “the best catfish you’ve ever had!”. For just $10, a heaping plate of golden fried catfish, fries, hush puppies, coleslaw, a cold drink, and a dessert can be had. Those who buy tickets in advance eat first and there will be a separate take-out line. Ink It Promotional Products will once again be screen printing a new, unique fish fry tee shirt. Organizers are lining up entertainment, so continue to check back for more details. Proceeds from this annual event enable RiverPark, Inc. to keep the park open, clean and safe for families and park patrons. Attendance at the park continues to grow as a new web presence on a Google site drew park-goers from across both the Triad and Charlotte. Fish fry tickets are available in Cooleemee at Davie Discount Drug, Town Hall and Village Auto Center; and in Mocksville at the Chamber of Commerce and Davie County Recreation and Parks. For those who use GPS devices, the actual RiverPark address is 645 Erwin Temple Church Road in Woodleaf, NC 27054.
for more information contact Benita Finney: 336.671.0343 or Cooleemee Town Hall: 336.284.2141. Visit River park at Cooleemee Falls on Facebook. Ducks on Sale Now – Join us for the Duck Race This Saturday at the Bullhole! The Great Bullhole Duck Race and Family Festival at RiverPark at Cooleemee Falls will be on Saturday, July 21 from 10 a.m.-2 p.m. Proceeds are used for the maintenance and safety of the RiverPark, or the “Bullhole,” as it is locally known. This year, the event will welcome additional elements to ensure a great family experience. There will be music provided by Emergency Music Service throughout the day and the walkway to the river will be lined with vendors and activities. Food, drink, and cold treat vendors will be available at the picnic shelter. The O’Neal family will place the ducks in the river and the race will begin at 1 p.m. Duck tickets are available at the Cooleemee Town Hall, Hot Diggity Diner, and Davie Discount Drugs in Cooleemee, in Mocksville at the Chamber of Commerce, Davie Recreation and Parks, and Foster Drug. Tickets may also be purchased at the Gateway Building in Salisbury and tickets will be available the day of the event. Purchase one duck for $5, a Quack Pack (5 ducks) for $20, or a Flock (20 ducks) for $100. The winning duck ticket holder will receive $250, second place receives $100, and third place $50. You do not have to present to win, but you will need to present a ticket upon claiming a prize. There are a few vendors spaces still available. Contact Benita Finney at (336) 671-0343 to reserve vendor space or with any questions. Information may also be found on the RiverPark at Cooleemee Falls Facebook page. (By Mike Barnhardt – Reprinted with permission from The Davie County Enterprise Record. Free Event – 20th Annual Lawn Mower Parade – Wednesday, July 4th in Cooleemee! Ducks on Sale for Duck Race! 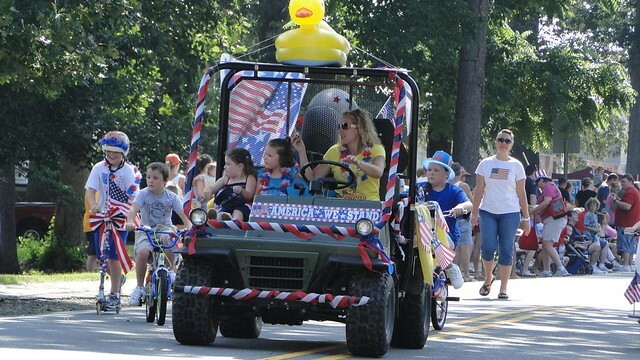 Come enjoy the annual July 4th patriotic lawn mower parade in Cooleemee this Wednesday. This patriotic event sponsored by the town of Cooleemee grows each year as entrants decorate a wide variety of lawn mowers, old and new. The lawn mower floats will parade up and down the quiet streets of Cooleemee beginning at 10 a.m. starting at the Cooleemee Elementary School. Come follow along the parade route and enjoy a stroll down the historic and picturesque streets lined with great old shade trees and historic mill homes. Following the parade there will be festivities on the Zachary House grounds including free watermelon and ice cream, games, water fun, and more! The Ladies Auxiliary of the Cooleemee/Mocksville VFW will be selling hotdogs, chips, and drinks as a fundraiser. There will be prizes for the best-decorated floats, lawnmowers, golf carts, or bikes. If entering the parade (lawnmowers, bicycles, walkers, floats), please be dressed or decorated in a patriotic theme and meet at 9 a.m. in the elementary school parking lot on Marginal Street. The fun in Cooleemee doesn’t end on July 4th. The Great Bullhole Duck Race & Family Festival will be held on Saturday, July 21st from 10 a.m. – 2 p.m. at River Park at Cooleemee Falls. The park is located at Erwin Temple Church Road, Cooleemee, North Carolina 27014. Grab your family and friends and enjoy the food, fun, and fellowship as we raise funds to upkeep the River Park at Cooleemee Falls. This year our family event will include music by Emergency Music Service, food trucks, vendors, activities for the kids and more! Duck Race begins at 1pm sharp. Cash prizes for winning ducks… 1st place $250, 2nd place $100, 3rd place $50. Duck Race tickets are now on sale for just $5 each!!! Tickets are available at Davie Discount Drug, Foster Drug, Cooleemee Town Hall, Davie County Chamber of Commerce, Davie County Recreation and Parks, Hot Diggity Dog, and the Gateway Building in Salisbury. You can also buy tickets from RiverPark board members! For more information, call (336) 284-2141. The Town of Cooleemee is receiving closed bids on trimming trees on its right-of-ways in town limits. Details on the job are available at the Town Hall in Cooleemee. Town Hall phone is 336-284-2141. Submitting bids will close at the end of business on March 16, 2018. FOR BIDDING ON THE CONTRACT OF TRIMMING THE RIGHT OF WAYS FOR THE TOWN OF COOLEEMEE YOU MUST MEET ALL OF THE FOLLOWING REQUIREMENTS. SUBMIT YOUR BID YOUR CLOSED BID TO COOLEEMEE TOWN HALL NO LATER THAN 5:00 PM ON MARCH 16. INCLUDE THIS LETTER SIGNED, THAT YOU HAVE READ AND UNDERSTAND THE SPECIFICATIONS AND REQUIREMENTS OF THIS LETTER. COPY OF PROOF OF $1 MILLION LIABILITY COVERAGE FROM YOUR INSURANCE COMPANY, SHOWING THAT YOU CURRENTLY HAVE COVERAGE AND WILL REMAIN COVERED DURING THE DURATION OF YOUR WORK BEING COMPLETED. YOUR CLOSED BID AMOUNT SIGNED AND DATED ON YOUR COMPANY LETTERHEAD, STATING AN EXACT DOLLAR FIGURE. ESTIMATES AND/OR QUOTES WILL NOT BE ENTERTAINED. TREES AND/OR LIMBS TO BE TRIMMED ON ALL TOWN MAINTAINED ROADS, CUT BACK 3 FEET OFF THE ROAD AND AT LEAST 20 FEET HIGH IN THAT 3 FEET ZONE. ROADS INCLUDE, MAIN ST STOP AT JUNCTION RD, MIDWAY ST, RUFFIN ST. WESTVIEW ST, JOYNER ST, WATT ST, DUKE ST, CHURCH ST, YADKIN ST, ERWIN ST, DAVIE ST, CROSS ST, RIVERSIDE DR, NEELY ST. UP TO HICKORY ST, HICKORY ST, GROVE ST, HOLT ST. STREETS THAT DO NOT HAVE TO BE TRIMMED ARE HWY 801, MARGINAL ST, CENTER ST, GLADSTONE RD, AND JUNCTION RD. PAYMENT FOR CONTRACT WILL BE AS FOLLOWED. 10% THAT WAS WITHHELD WILL BE PAID ONCE JOB HAS BEEN INSPECTED AND APPROVED BY THE TOWN BOARD. I HAVE READ, UNDERSTAND, AND AGREE THAT I CAN MEET THE REQUIREMENTS AND SPECIFICATIONS AS LISTED ABOVE.